Hollywood Bank is located at 6777 Hollywood Boulevard in Los Angeles, California and was completed in 1927. This building was designed by Meyer & Holler Architects and stands 183 feet tall with 13 floors. 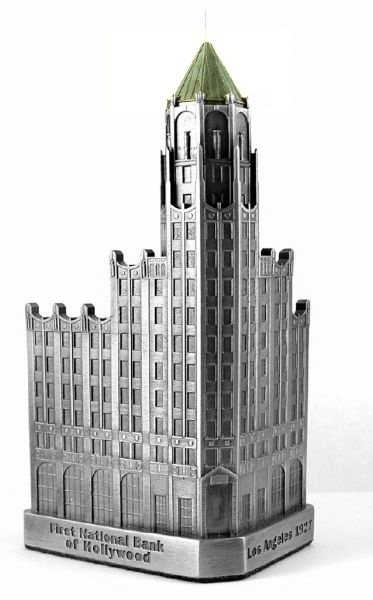 First National Bank of Hollywood was the tallest building in Los Angeles from 1927 to 1932.This pewter replica stands 6" tall at 1" = 35 feet. Shown in antique pewter with a green highlighted roof. I already had the small replica of this bank but had to have the bigger one. This replica is a real work of art! The larger scale,roughly 1/418, allows the capture of more detail. Very nicely done.